With his wooden alter-ego Buddy, more tours and television followed.. Late Night with Conan O'Brien, Canada's "Comedy At Club 54," The Daily Show, America's Talking and many more. His current line-up of puppet friends include: The space alien Krelmin, The flamboyant Milo DeVille, and the lovable Papa. 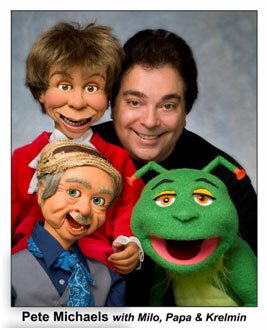 Not to mention his finale; the "re-union" of Sonny & Cher with real HUMAN puppets! The Incredible Show-Stopping "Little Tenor;" (A tribute to Pavarotti with Pete providing the actual operatic singing voice,) is both amazing and hilarious! Pete Michaels is a member of SAG & AFTRA and has appeared on radio and in many television commercials. He is also an accomplished vocalist and musician.